Enid Bootzin is a Community Services Representative for Hearts to Home, a home health care agency in Glendale, Wisconsin. 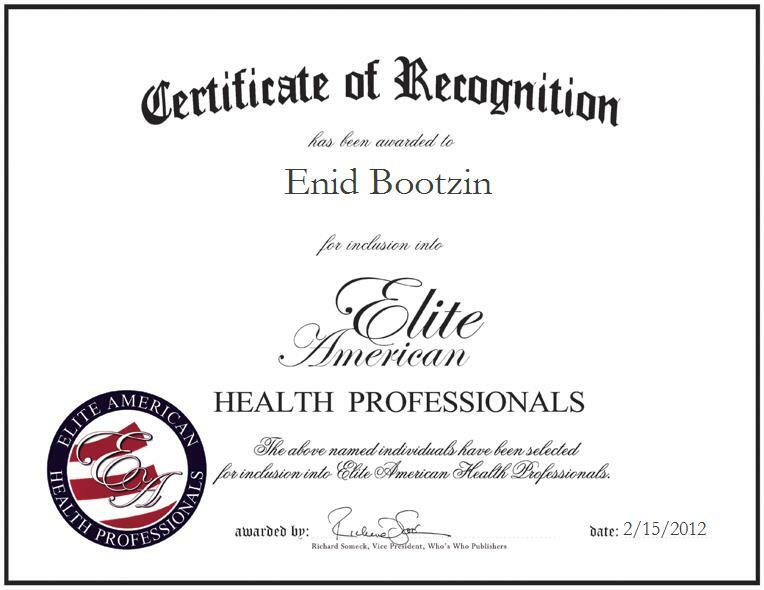 An expert on health care administration, Ms. Bootzin handles marketing, budgeting and hiring initiatives, and she is also responsible for managing human resources, evaluating client assessments, scheduling, consulting on leadership, and offering strategic insight to ensure quality and future growth. Ms. Bootzin has garnered a reputation of distinction for her knowledge and expertise; in 2007, she was named Professional of the year, and in 1997, she was named One of 25 Nursing Home Administrators in Milwaukee by The Business Journal. Respected and trusted as a valued administrative professional, Ms. Bootzin’s resourcefulness separates her from her peers. She remains abreast of trends and developments as a member of the Wisconsin Healthcare Association, the Wisconsin Association of Homes and Services for the Aging and the Milwaukee Wisconsin Chamber of Commerce.